As an HPC Integration Partner for ANSYS®, Nor-Tech is continuing to push the benefits of CAE (Computer-aided Engineering) using HPC (High Performance Computing). Nor-Tech HPC & ANSYS® help you get your product to market ahead of your competitors. ANSYS® is one of our key software partners in the CAE arena. ANSYS® has products across every simulation discipline ranging from: structural mechanics, fluid dynamics, thermal and electromagnetic analyses — allowing you to maximize the value of your HPC resources and support cross-disciplinary engineering teams. ANSYS® has many CAE products that are the best in their field. ANSYS® Fluent and ANSYS® Mechanical are great examples. 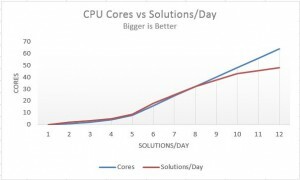 ANSYS® delivers hybrid parallelism for multicore/multiprocessor servers within clusters, architecture-aware partitioning, parallel file input and output, and nearly linear scalability up to 3,072 cores. The suite includes a parallel direct sparse solver, a parallel PCG solver, and GPU acceleration for both shared memory and distributed memory parallel solvers. High-frequency electromagnetic simulations are supported by ANSYS® capabilities such as distributed memory parallelism and the adoption of the latest Intel compilers and math kernel libraries. Both ANSYS® and Nor-Tech are Intel® Cluster Ready members. Intel Cluster Ready architecture means pre-tested inter-operability, so you realize HPC benefits faster. Match certified systems with registered applications and enjoy the freedom to focus on purchasing the configuration that best fits your application workload – without worrying if components will work together. Intel Cluster Ready solutions come with the Intel® Cluster Checker tool, to help you validate that the cluster remains within certification over time and troubleshoot any problems that occur. The result: greater productivity and higher return on your HPC investment. To see how NVidia Tesla GPGPU’s can accelerate your CAE work see this link GPU Computing with ANSYS®. Computer-aided engineering (CAE) simulations enable engineers to design more virtual prototypes thereby spending less time building physical ones. More iterations leads to a higher quality finished product. GPUs further improve efficiency by accelerating simulation-time. Mechanical: ANSYS® Mechanical® 14.5 supports a full feature set including use on multiple GPUs. Fluids: ANSYS® Fluent®® 14.5 offers a radiation heat transfer model on GPUs, along with a beta feature of an AMG solver on single GPU. Electrical: ANSYS Nexxim 14.5 supports a full feature set. 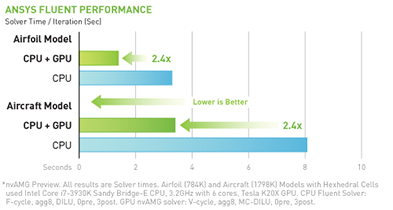 ANSYS® Mechanical® 14.5 provides significant performance speedups when using the latest NVIDIA Tesla K20 GPU. See the performance results below. ANSYS® Fluent®: The initial implementation of ANSYS® Fluent® 14.5 is designed to run on a single GPU, and in the future on a single node with multiple GPUs, or across multiple nodes with multiple GPUs in a cluster configuration. 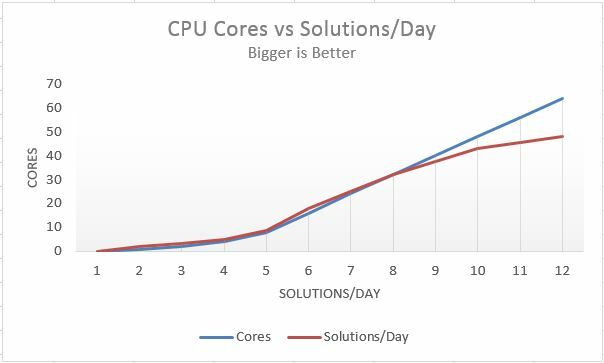 The graph below shows the solver time for each iteration for two unique ANSYS® Fluent® models. Both models utilize a GPU which results in faster completion of the solver. Contact Nor-Tech today for a no cost opportunity to see the performance gain you will get by moving to HPC clusters from desktop or workstation computing. See how Nor-Tech’s over ten years of HPC expertise can help you leverage advances from Intel, NVIDIA® and ANSYS® to get your products to market faster than your competition. Our demo cluster has the latest Intel Xeon E5-2600 V2 CPU’s, NVIDA® K20X GPU’s, and QDR InfiniBand. Click here to get started on an evaluation today.